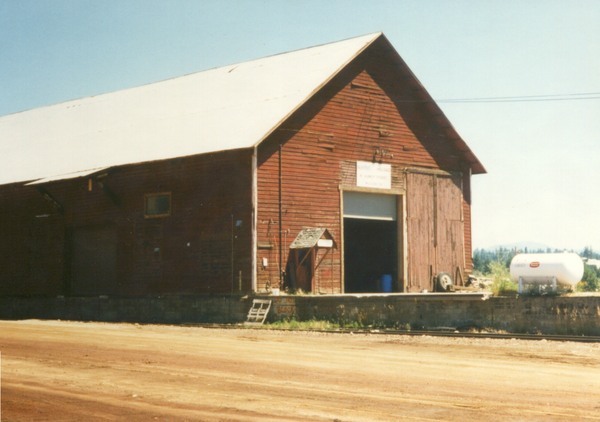 In the first decade of the 1900s the McCloud River Lumber Company constructed a series of shop buildings immediately south of the roundhouse. These buildings served the railroad well until the new diesel shop building replaced them in the mid-1950s. The railroad afterwards used the buildings mostly for storing rolling stock. Shortly after U.S. Plywood purchased the McCloud companies in 1963 they decided to add a large warehouse to the sawmill operations, principally to warehouse products the company produced elsewhere such as plywood, hardboards, and other products that would be brought into McCloud. 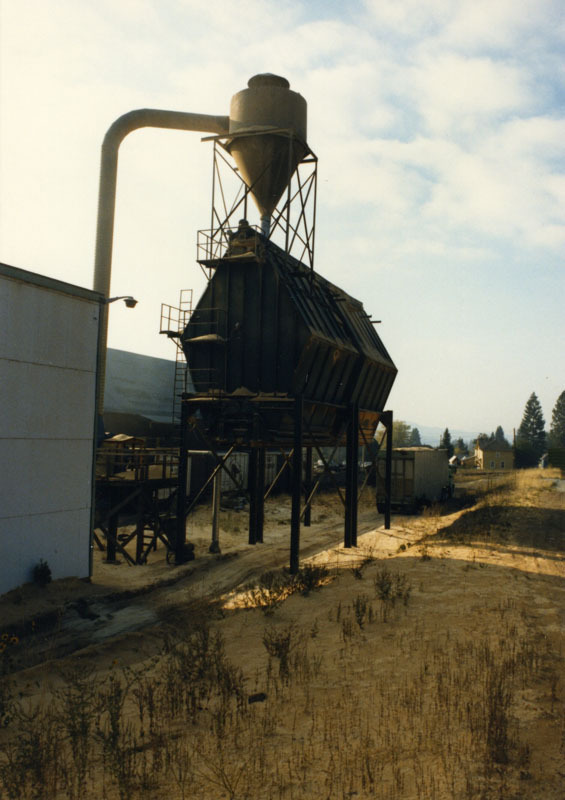 This allowed U.S. Plywood to ship carloads of mixed products directly from McCloud. The railroad chose one of the old shop buildings as the site for this new facility. Most of the existing shop building remained intact, with the large warehouse added onto the north end of the structure. The finished building had two rail sidings, one that ran in the open along the west side of the building and the other running into an enclosed area on the east side of the building. The facility also included a truck loading area. 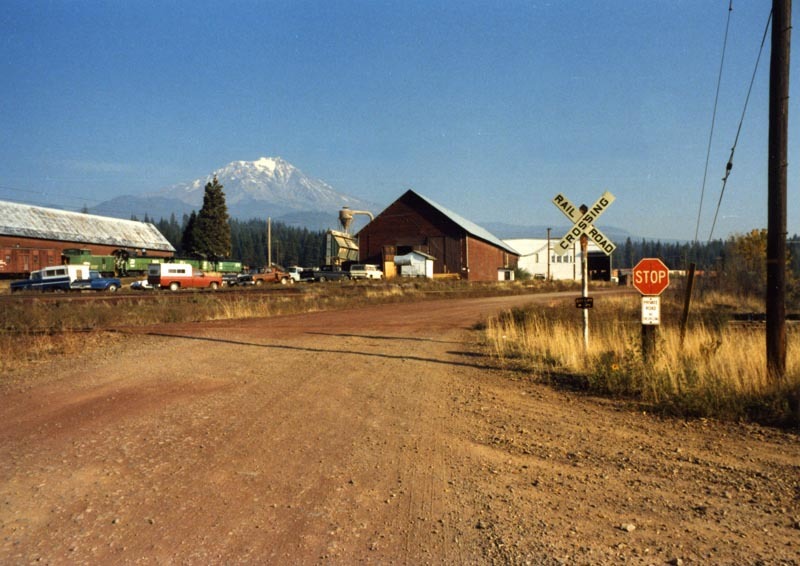 The closure of the McCloud mill in 1979 caused McCloud River Railroad to go looking for another use for the warehouse. 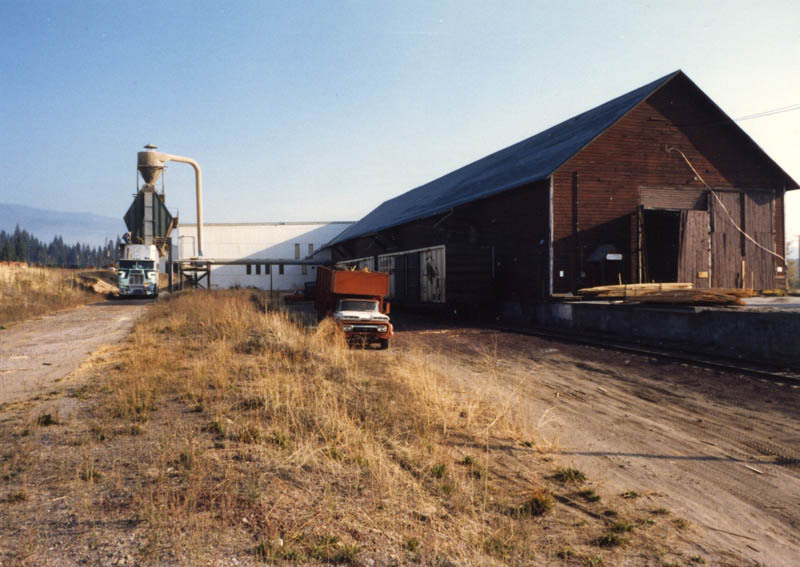 A plywood wholesaler leased the facility for about a year in late 1981/early 1982 to warehouse plywood purchased during slack times in the plywood market and then sold when prices improved. Shortly after the plywood wholesaler closed up shop a new company, McCloud Moulding Inc., leased the warehouse and built a small remanunfacturing plant. The operation, which employed sixteen people, opened for business on 27 October 1982. 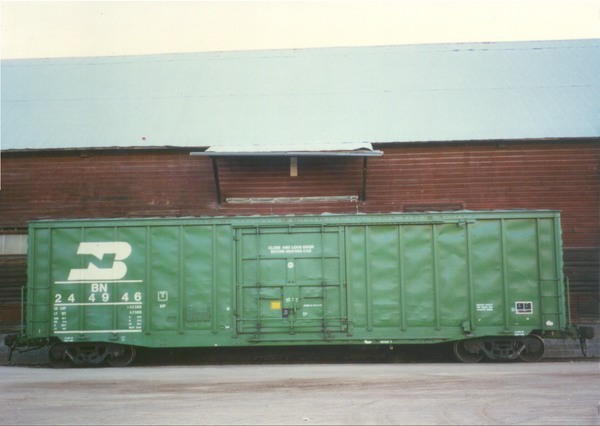 McCloud Moulding survived for only about a year before it shut down, but in that time it did ship some of its output by rail, including at least one piggyback load (truck trailers shipped on a flatcar) which contained stock bound for Virginia, shipped on 3 November 1982. The warehouse did not remain idle long after McCloud Moulding closed. A little less than a hundred miles southwest of McCloud lay another small former company timber town named Korbel. Korbel lay in the redwood country, along the Mad River a few miles inland from the coastline. The Northern Redwood Lumber Company started the town, with the Simpson Timber Company taking over in 1956. Like McCloud the Korbel mill shipped its product over a common carrier shortline, in this case the Arcata & Mad River Railroad. The "Annie and Mary" as it was known ran seven and one half miles from Korbel down to a connection with the Northwestern Pacific Railroad at Korblex, on the northern edge of Arcata. This situation worked well until the winter of 1982/1983, when a series of powerfull storms washed the NWP out in many places. The NWP finally restored service to the Eureka area in early June; however, the company instituted a $1,200 per carload surcharge on all traffic moving to and from the Eureka area. The Arcata & Mad River Railroad closed up shop, as Simpson and the other shippers on the line found trucking lumber to other railheads in the area far more economical than paying the new surcharge. 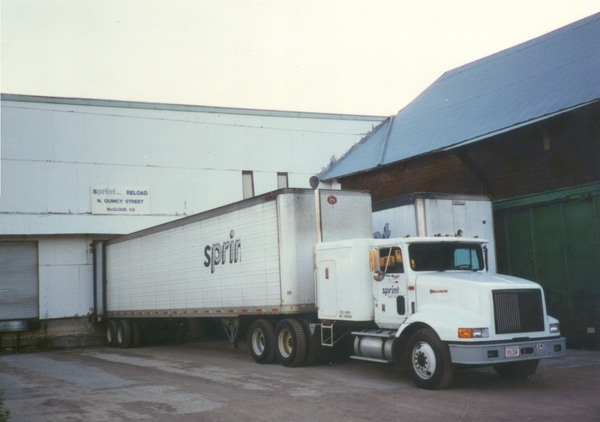 The McCloud River Railroad brought in Sprint, Inc., a Virginia-based transportation and logistics company, to operate the warehouse. The company soon started receiving 40-80 carloads of paper each month, all of which arrived on the BN at Lookout Junction. 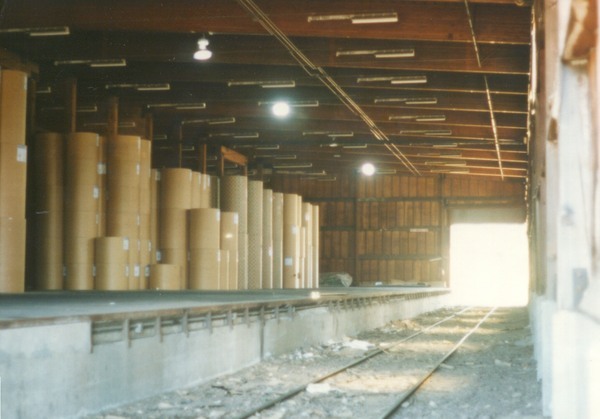 The McCloud River Railroad brought the paper to McCloud, where Sprint unloaded the cars and stockpiled the paper in the warehouse until R.R. Donnelley & Sons needed it. Sprint Trucking, an affiliated company, made the final delivery from the warehouse to the printer, supplemented by other local trucking companies as needed. The paper arrived in boxcars of all types, mostly belonging to various railroads operating in the northeastern U.S. and Canada. Paper remained as the dominant product handled through Sprint Reload. However, the business did handle other products as offered, with sporadic shipments of huge rolls of wire handled on bulkhead flatcars showing up in the early to mid 1990's. The reload also saw a few carloads of specialty lumber products as well. The railroad worked on a large number of other possible traffic sources that could move through the warehouse, but none of the traffic lasted long. An overview of McCloud Moulding. Pat Driscoll photo, Jeff Moore collection. Two McCloud River incentive per diem boxcars spotted at the loading dock. Pat Driscoll photo, Jeff Moore collection. A loaded woodchip truck pulling away from the chip loader. Pat Driscoll photo, Jeff Moore collection.